Many of you may already be familiar with the endocannabinoid system (ECS). The ECS is a major signalling network found across the human body. It is responsible for influencing a wide range of functions (such as pain, inflammation, stress, immune response, mood and appetite) and maintaining their balance. It is working assiduously to monitor functions and will trigger adjustments whenever external factors cause any of the functions to become unbalanced, returning them to homeostasis. The ECS is highly complex and its exact workings are still being understood. To further complicate matters, every person has a different endocannabinoid system. This means that following even the most clear and concise dosage instructions on a CBD product may provide completely differing effects on two different people. Each person genetically unique, is in differing states of health and will have a different tolerance to CBD. Many CBD consumers are suffering from debilitating ailments whereas others wish to merely calm their anxiety or improve overall health. All of these factors will play a role in how well CBD works for them. To contextualise this, someone at peak physical fitness who is exercising regularly and is using CBD for recovery will likely require a smaller dosage as their body will process a medicine differently than someone with a less active lifestyle. At the other end of the spectrum, someone who is treating chronic pain with CBD will require a larger dose. Similarily, age and weight may also factor, for example an older consumer with a weaker processing system may require a smaller dose whereas a larger person may require a higher dose. Tolerance can also build with regular use. As exposure to cannabinoids increases the human body may begin to withdraw cannabinoid receptors rendering a consumer less sensitive to the effects. This happens in all neurotransmitter systems, the ECS is no different. One of the most intriguing aspects of CBD however, is the presence of reverse tolerance. As cannabinoids are naturally stored in the body’s adipose tissues (fat cells), they tend to remain and dissolve from fat cells back into the bloodstream. This occurs even when someone is not actively consuming CBD. Unlike a traditional tolerance system where more substance is required to achieve the same results, CBD creates a scenario in which less new product is required to blend with the stored fat-cell material. Regardless of whether the correct dosage of CBD works for your body or not, it is important you house realistic expectations of what it will do. Do not expect to take a couple of drops of CBD oil and all of a sudden you will be cured of your ailment. The effects of CBD are not instant for everyone and this unfortunately leads to many people making the same mistake of using CBD for a short period, expecting to be cured then when it does not work immediately they discontinue use. It may take some time to work and the key lies in finding the correct dosage. Isolate or Full Spectrum Extracts? Another important point to note around dosage is that single molecule cannabinoids such as CBD isolate products are simply not as adaptable or efficacious as whole plant formulations. CBD isolate lack crucial aromatic terpenes and other cannabinoids which are known to interact synergistically to heighten CBD’s therapeutic benefits. Preclinical research shows full spectrum CBD rich cannabis oil is operative at much lower doses and has a wider therapeutic window than a CBD isolate product while animal studies have shown that CBD isolate requires very high and specific doses to be effective and may prove more likely to raise problematic drug interactions than with whole plant extracts. 1) Start by taking one or two drops initially. This will allow you to see how you feel much like a test patch of a new cosmetic. 2) If all is well, start to increase the dose to 2-4 drops per day for the first week or two. This will allow ample time to monitor your body’s reaction. 3) Spread the drops throughout the day, for example taking one or two drops in the morning and the evening. 4) Finally, if you don’t feel it is helping you, begin to increase the dosage at a slow rate until you find your sweet spot. This is known as the up-titration method. Remember to place drops under your tongue for absorption via the sublingual gland for north of 90 seconds before swallowing to maximise bio-availability. 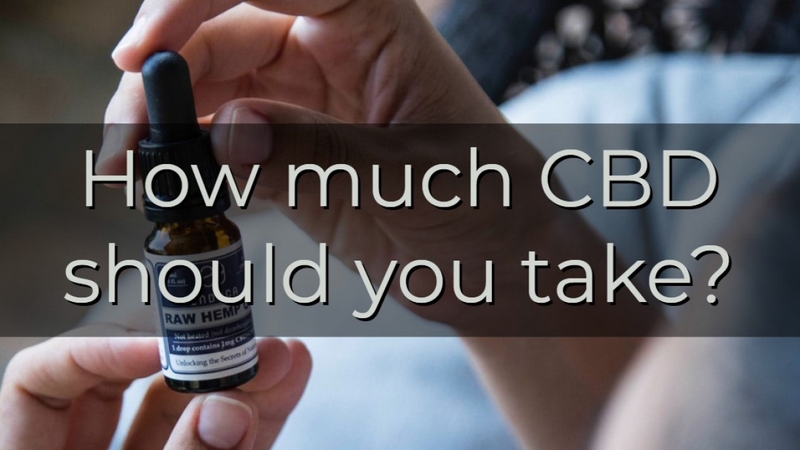 How much CBD does each drop contain? So what does 10mg of CBD oil look like? Below is a general guide to how much CBD is present in each drop of an industry standard 10 milliliter bottle of oil. What about CBD e-liquid? This is not as easy to gauge as not only will concentration in e-liquid vary but so will frequency and volume of use. Generally speaking a standard tank will hold 2ml of e-liquid, with that said below is a general description of how much CBD will be in each 2ml tank for each of the following concentrations of e-liquid assuming the e-liquid is enclosed in a 10ml bottle as standard. Of course there are many other routes of administration for CBD such as balms, edibles, drinks, etc. each with varying rates of bio-availability. Our previous blog on how to use CBD covers a number of these methods in more detail. Finally, below is a guide to how much CBD you may require each day to attain your desired outcome. It is apparent that due to the complexity of cannabinoids and the fact they are so highly nuanced with many changing and interacting components, it is difficult to advise a precise CBD dosage for each consumer. It will require patience as you trial-and-error your way towards your ‘sweet spot.’ Luckily for us, due to the safety profile of the cannabis plant these trial and subtle, experimental modifications are considered safe in the hands of any consumer even without a medical education. Just don’t give up after a couple of days when it doesn’t immediately meet your expectations.